The Multilin HardFiber System is an IEC 61850 Process Bus Solution that allows the mapping of measurements made in the switchyard to protection relays located in the control house using secure communications. The HardFiber System is designed to reduce the overall labor associated with the tasks of designing, documenting, installing and testing protection and control systems. By specifically targeting copper wiring and all of the labor it requires, the HardFiber System allows for greater utilization and optimization of resources. The HardFiber System was designed to address these challenges and reduce the overall labor associated with the tasks of designing, documenting, installing and testing protection and control systems. 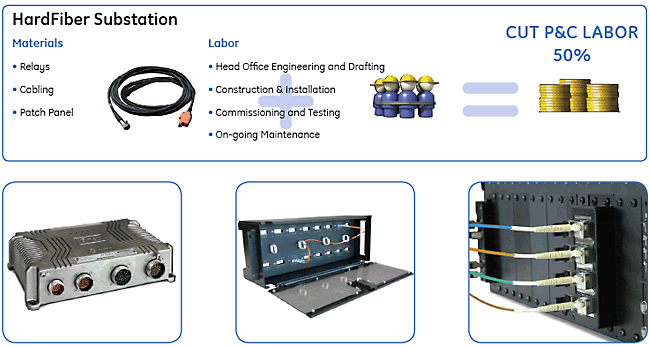 By specifically targeting copper wiring and all of the labor it requires, the HardFiber System allows for greater utilization and optimization of resources with the ultimate goal of reducing the Total Life Cost (TLC) for protection & control. The underlying driver for the HardFiber System is the reduction of Total Life Costs of protection and control through labor and resource optimization. This optimization is achieved by replacing individual, labor-intensive, individually terminated copper wires with standardized physical interfaces and open digital communications. Traditional substation designs require large amounts of skilled labor to create engineering drawings, pull and terminate miles of copper cables, and test and troubleshoot thousands of connections. The HardFiber System replaces labor-intensive processes with quick installation, off-the-shelf equipment and made-to-order cables. The HardFiber Brick Process Interface Unit (Order Code Brick-4-HI-X-****-X-X-X) is an I/O device designed for mounting in utility switchyards. The S-Brick version must be mounted inside equipment cabinets or kiosks. The ruggedized version may be mounted outdoors in the switchyard. The ruggedized Brick uses connectorized copper and fiber optic cables for ease of installation and for environmental protection. The Brick works directly with models of the GE Universal Relay (UR) family, and any compliant third party device. The HardFiber Brick Process Interface Unit (Order Code Brick-4-HI-X-****-X-X-X) is ruggedized I/O device designed for mounting outdoors in utility switchyards. The Brick uses connectorized copper and fiber optic cables for ease of installation and for environmental protection. The Brick works directly with models of the GE Universal Relay (UR) family, and any compliant third party device. The custom FOA cables are ordered to length, and are connectorized at each end. These FOA cables require the use of the Cross Connect Panel, and the FOR Indoor Relay Fiber Cable, to connect to the UR or other compliant devices. 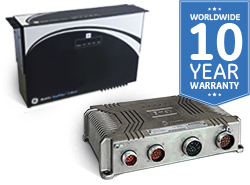 DC power to the Brick is distributed by the Cross Connect Panel, and short circuit protection for the Brick power supply is included in the FOA cable. The FOA Splice Cable is intended to meet customer standards for fiber optic cable distribution through the switchyard. The FOA Splice Cable is connectorized at the Brick end, and ends in copper and fiber pigtails. The customer must provide their own fiber optic cables, DC supply to power the Brick, and perform their own splicing to the pigtails of the FOA Splice Cable. The architecture of the HardFiber System is driven by the mapping of signals between the primary apparatus and the protection and control devices. The measurement of field signals and respective mapping of these signals, using the open IEC 61850 communications protocol, back to the control house is done through a hardened interface device called the HardFiber Brick. Using made-to-order Outdoor Fiber Cables connecting the Brick to a Cross Connect Panel in the control house provides fast and error-proof installation without the need for on-site splicing or terminating. Keeping true to the existing topology of traditional substations, each protection and control device included in the zone of protection will be connected directly to Bricks through dedicated fiber optic connections. This simple, purpose-driven architecture that uses the IEC 61850 open standard for communications, provides dedicated point-to-point connections between the Brick and protective relays without introducing any issues relating to data synchronization, setting management or Cyber-Security. Each Brick transmits measurements and accepts controls from up to 4 separate protection and control devices. The true test of any system, including a Process Bus system, is its ability to incrementally scale up to meet specific applications without adversely affecting the other devices in the system. Today’s protection and control systems are already naturally scalable. The challenge for communication-based protection systems becomes making extensions and modifications without disrupting the in-service protection and control system. 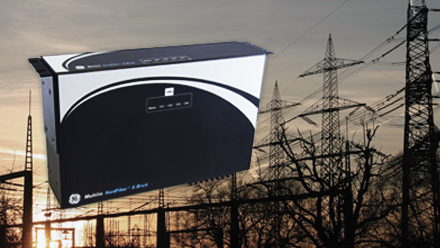 By recognizing that the mapping between power system signals and protection and control devices is fundamentally driven by the topology of the underlying substation, the HardFiber System is optimally partitioned and connected to allow for additions, modifications and upgrades to the system – without risking interruption or degradation to critical in-service protection. The HardFiber System provides an unprecedented level of diagnostics and self-checking, allowing critical protection and control systems to do something that they have never done before – operate without routine maintenance. Internal diagnostics and self-tests within each Brick monitor dozens of critical internal subsystems and provide this information several hundred times per second. Duplicate Bricks can be provisioned to acquire each input signal twice, allowing protection and control devices to continuously crosscheck critical protection measurements before executing commands via fully redundant outputs. With the HardFiber redundant architecture, each protection and control device can be configured to maximize dependability and security, addressing specific application requirements.